LEED Green Projects - Fullerton, Santa Ana, Anaheim | Pure Effect, Inc.
Americas’ use of the limited public water supply continues to increase as land use expands. Municipal potable water is delivered to customers for domestic, commercial, industrial and other purposes and is the primary source of water for most buildings. High water demand is straining limited supplies and unregulated wastewater can overwhelm wastewater treatment facilities and the untreated overflow can contaminate rivers, lakes, and other sources of potable water with bacteria, nitrogen, toxic metals and other contaminants. Additional municipal supply and treatment facilities must then be built, at public cost. The LEED program encourages efficiency measures that significantly reduce the amount of potable water used by buildings. These measures involve all the water usage associated with buildings including indoor water for restrooms, outdoor water for landscaping, and process water for industrial purposes and buildings systems. Efficiency strategies, combined with consumption monitoring can dramatically improve water conservation. Many LEED-rated buildings reduce potable water use by more than 50%, with direct benefits to a company’s bottom line as well as the environment. Installing water-efficient fixtures, using non-potable water for flushing functions and installing submeters to track water use trends, can achieve indoor water use reduction. Low-flow fixtures use less water specified in the EPA Act 1992 requirements. Projects can further reduce their potable water consumption by designing and installing plumbing systems that can use captured rainwater or grey water in flush fixtures. Landscape irrigation is a significant component of many commercial buildings’ water use and thus an opportunity to conserve water. Specifying water-wise landscaping and water efficient irrigation technology, using nonpotable water for irrigation and installing submeters to track and log irrigation trends, can achieve a reduction in irrigation water use. Project teams should incorporate native and adapted species in the landscaping design because these plants tend to thrive without irrigation, pesticides or fertilizer. 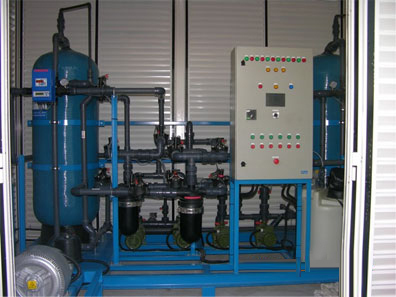 Process water is used for industrial processes and building systems. These systems include cooling towers, boilers and chillers that provide heat, cool air and water for building operations. Process water also includes the water used for certain business operations (such as washing machines and dishwashers). Commercial building projects can reduce process water use by selecting efficient cooling towers, chillers, boilers and other equipment and by integrating harvested rainwater and non-potable water to work in conjunction with specified equipment.